Indian Overseas Bank beat Chennai Customs 90-57; while Integral Coach Factory beat Vijaya Bank 88-77 on day 4 of the championship. The 3rd place game will tip off at 4:00 PM, while the championship game will tip off at 6:00 PM. Bengaluru, 3rd February 2018: The 4th Mulki Sunder Ram Shetty All India Basketball Tournament, organised by the Vijaya Bank, is currently underway at the Sree Kanteerava Indoor Stadium. The battle for 3rd place between Chennai Customs and Vijaya Bank will tip off at 4 PM; followed by the championship game between Indian Overseas Bank and Integral Coach Factory at 6:00 PM. Pratham Singh of IOB drives hard to the rim against Chennai Customs at the 4th Mulki Sunder Ram Shetty All India Basketball Tournament. 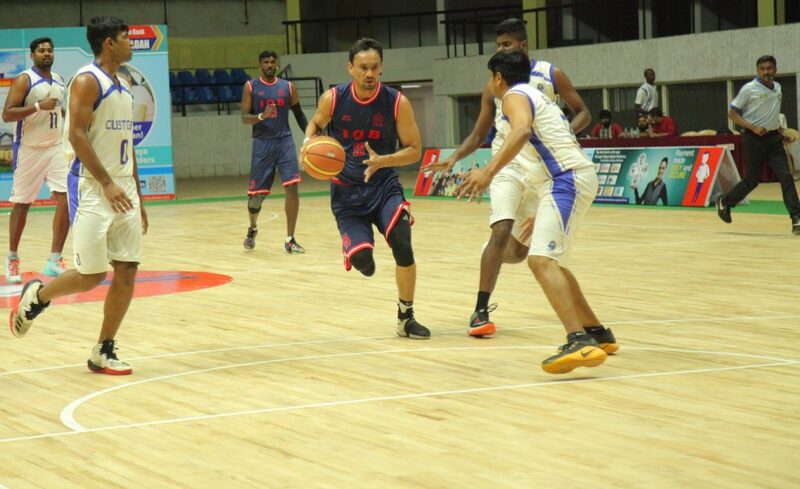 The Indian Overseas Bank are through to the finale of the 4th Mulki Sunder Ram Shetty All India Basketball Tournament after they blew out Chennai Customs 90-57 in the first semi-final of the day. IOB men dominated the game right from the tip-off. Praveen Kumar got his team going early as the ball was zipped around from wing to wing. The ball movement helped Aravind Annadurai and Jeevanantham P to get deep positions in the paint and score on easy cuts to the hoop. The Customs team struggled to score the ball early as their 1st option, Justin, was tightly guarded by Prasanna Venkatesh. Customs was quickly forced to look for other options and leaned on R Ramakrishnan to score their opening two baskets of the game. IOB continued to move the ball well for wide open jump shots and every other miss was collected by either Jeevanantham or Annadurai. With Justin’s struggle on the offensive end, the scoring load for the team was shared between R Vinoth, R Ramakrishnan and point guard Suresh Kumar. However, the IOB man-to-man pressure was too much to overcome for a feeble Customs offence who trailed by 14 at the half. IOB led 44-30. The third quarter saw the resurgence of Justin, who scored half of his 16 points in the quarter. However, his scoring surge was just not enough. IOB continued to operate like a well-oiled machine and offered no opportunity to the Chennai Customs to mount a comeback. The IOB bench stepped in for their starters and continued to execute their game plan with the same precision. 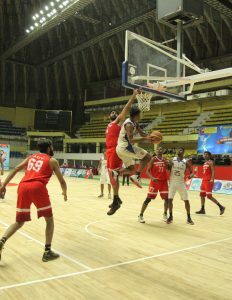 The final quarter of play saw extended playing time for Sateesh Kumar and Abhilek Paul, who ensured that IOB ended the game with a 33-point margin of victory. For his excellent play in the semi-final, Justin earned the honour of ‘Best Player of Semi-Final 1’. He received the award from Mr. Vijay Dube, General Manager – Vijaya Bank. Anil Kumar of Vijaya Bank finishes at the rim against Integral Coach Factory at the 4th Mulki Sunder Ram Shetty All India Basketball Tournament. The second semi-final of the day saw the hosts Vijaya Bank take on Integral Coach Factory in what was a high intensity, end-to-end contest. The first half of the game was a tightly contested affair as ICF’s P Vijay and Anto Bethle led the offensive charge for their team. Their scoring push was matched by Vijaya Bank’s tandem of Arvind Arumugam and Anil Kumar BK. The teams continued to exchange baskets and ended the first quarter 20-18 in favour of Vijaya Bank. Both teams continued to trade blows like prize fighters, however, towards the end of the half, a couple of quick steals and some flashy passing by Anto Bethle, helped ICF get their noses in front with a 46-38 lead. ICF continued their spectacular play in the third quarter and helped shift the momentum of the game in their favour. Arumugam and Anil Kumar battled hard to get Vijaya Bank back into the game but were outmatched by their opponents in yellow. The hosts made one final push to get back in the game, midway through the fourth quarter, as they managed to force a couple of turnovers in quick succession but their run was short lived due to some solid rim protection by P Vijay and Jaya Venkatesh. Vijay’s dominating presence in the paint coupled with some solid playmaking by Bethle helped ICF pull away for a 11-point victory. For his 23-point performance in the game, Vijaya Bank’s Navin Raj received the ‘Best Player’ award from Mr. Vijay Dube, General Manager of Vijaya Bank. After registering a mammoth 31-point victory earlier in the day, and securing a +36-point differential, ICF cemented their spot in the semi-finals, which made this encounter a do-or-die situation for the Chennai Customs. A win for Customs would tie the three teams (ICF, Chennai Customs and Income Tax) at two wins each and force a scenario where the better point-differential between the two competing teams would decide the final team to qualify for the semi-finals. With Akilan Pari not suiting up for Income Tax, Chennai Customs believed they had a shot at beating the favourites. Income Tax got off to a slow start as the team appeared to be discombobulated. Inaccurate passes and poor spacing meant that the Income Tax team struggled to score on the 2-3 zone defence. Chennai Customs on the other hand, came out of the gates strong with Justin constantly attacking the paint for some easy scores on the Income Tax bigs. Income Tax went to their tried and tested formula of going to Rikin Pethani in the post but the big man struggled to score as the Customs bigs played him much more physically than any other front court in this tournament. The Customs team also nullified the shooting of an otherwise impactful Ravi Kumar by forcing him to put the ball on the floor and make a play. Income Tax’s scoring load was ably shouldered by Ram Kumar who scored 13 of his 21 points in the first half to cut into Custom’s lead. The half time score read 43-39 in favour of Chennai Customs. The second half saw Customs point guard Suresh Kumar take over the game as he put on a passing clinic often finding Hariram and big man R Vinoth for wide open jumpers from mid-range. Justin went on a personal scoring run as he scored 19 of his 38 points in the third quarter alone. Justin’s push was matched by Pethani who scored 13 of his 19 points in the same period. However, a couple of turnovers towards the end of the quarter helped the Customs team grow their lead to 12 points. Customs led 73-61. The 4th quarter was a low scoring affair as both teams struggled to convert their shots. Customs maintained their healthy lead and contained Pethani and his men to just 8 points in the quarter. Chennai Customs pulled away with the victory and ensured a semi-final qualification with a better point differential (+23) than that of Income Tax (-1). 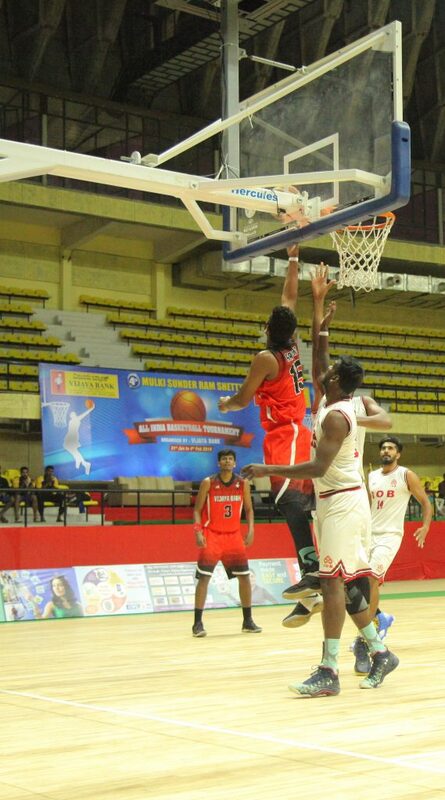 Arvind Arumugam of Vijaya Bank with the reverse layup over IOB defenders at the 4th Mulki Sunder Ram Shetty All India Basketball Tournament. In a nail biting affair, Vijaya Bank men rise up to the occasion, as they push a stacked Indian Overseas Bank to the very last second. Vijaya Bank started the game strong as their 2-3 zone defence contained IOB big men Jeevanantham and Aravind Annadurai. The trio of Karthickeyan S, Navin Raj and Arvind Arumugam manned the paint and did not allow any easy baskets. Anil Kumar took over the point guard responsibilities and pushed the tempo of the game. Vijaya Bank thrived on the quick pace as they out ran the IOB team for some easy two versus one fast break opportunities. IOB soon brought on the experienced big man Vineeth Ravi Mathew, who drew fouls in the paint and scored six straight points for his team. The quarter ended with a two-point lead for Vijaya Bank, 22-20. In the second quarter, Vijaya Bank’s trio of Anil Kumar, Arvind Arumugam and Navin Raj combined for all but one of the 21 points scored by the team. In response, IOB’s Prasanna Venkatesh and Hareesh Koroth combined for 19 of IOB’s 26 points in the quarter and helped their team enter half time with a lead, 46-43. The third quarter of the game saw Anil Kumar make a push to regain the lead. His effort was ably supported by Karthickeyan who chipped in with 7 points of his own as Vijaya Bank made a run and regained the lead, 55-48. Mid-way through the quarter, Karthickeyan committed his 5th foul which broke the team’s offensive flow. IOB made the most of this opportunity and made a run to regain the lead. The team continued to ride the hot hand of Prasanna Venkatesh who added six more points to his tally. Aravind Annadurai made his presence felt as he grabbed offensive rebounds and scored on a, now much smaller, interior defence of Vijaya Bank. With the game tied at 57, Anil Kumar drilled a three pointer with a hand in his face. Arvind Arumugam scored on a couple of post moves to help Vijaya Bank regain a three-point lead over IOB. Vijaya bank lead 65-62. As the 4th quarter began, the teams continued to trade baskets. Vijaya Bank crowded the paint on defence and made it hard for Aravind Annadurai and Jeevanantham to operate. Roby Thomas chipped in with some crucial points for his team as they looked to extend their lead. In response IOB guards, Hareesh K and G Sivabalan provided some valuable scoring for their team off the bench. Midway through the quarter, Vijaya Bank guard Clinton Andrew fouled out, creating another break in the team’s offensive flow. IOB quickly capitalized on it and built a six-point lead. With under two minutes to play and a six-point deficit, Anil Kumar drilled a three pointer with a hand in his face. In the subsequent possession, IOB ran a play and got Mathew free under the board, who appeared to have been hit on the arm but got no whistle from the referee. Vijaya Bank quickly charged down the court and forward Navin Raj threw it down with authority to cut the lead down to one. IOB’s bench continued their relentless protest on the no-call and received a technical for dissent. Anil Kumar stepped up and made the free-throw to tie the ball game. On the subsequent possession, Vijaya Bank failed to regain the lead due to IOB’s formidable defence. A quick timeout pushed the ball up the court for IOB, who ran a play to get the ball to Annadurai in the post. Navin Raj committed his fifth foul on the entry pass and sent Annadurai to the line. With the game on the line, Annadurai split his free throws, which gave a sliver of hope to the fighting Vijaya Bank squad who called for a timeout. The team ran a well-designed after-timeout play but missed the shot and the failed to gather the rebound as it bounced off the hand of a Vijaya Bank player. IOB quickly secured the ball and Annadurai ran hard to convert the layup with contact which increased their lead to three. 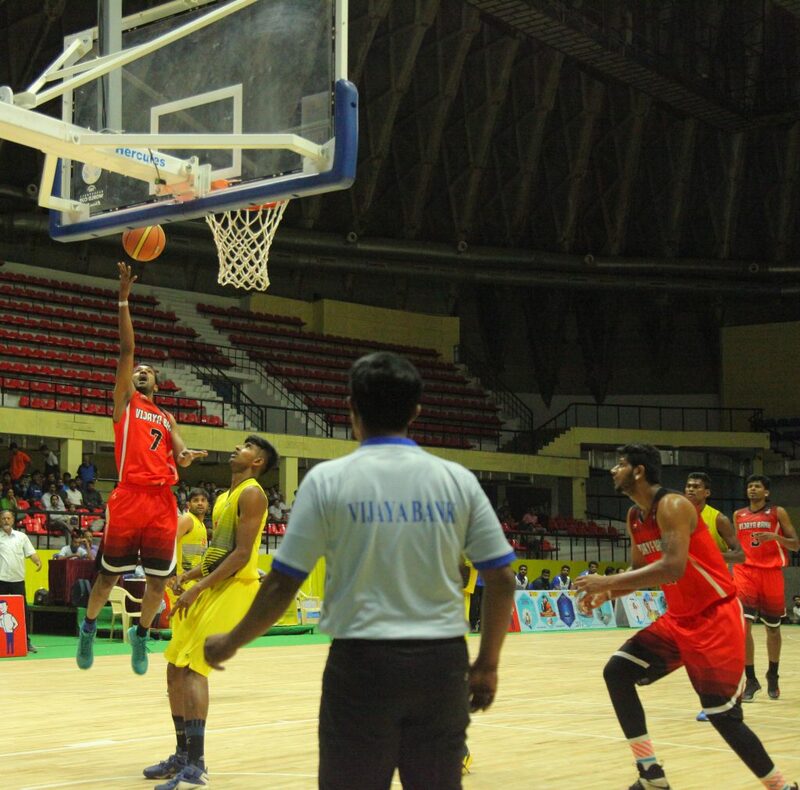 Subsequently, Annadurai missed his free throw and the rebound was quickly pounced upon by Arumugam who pushed the ball up the court to cut the lead down to one. IOB called for a quick timeout and ran a play to get the ball into Annadurai’s hands who was quickly fouled. With 8 seconds on the clock and mounting pressure, Annadurai missed both his free throws. Vijaya Bank failed to secure the rebound and the ball fell into the hands of Vineeth Mathew who was immediately fouled. He split his free throws as IOB came out on top, 83-81.